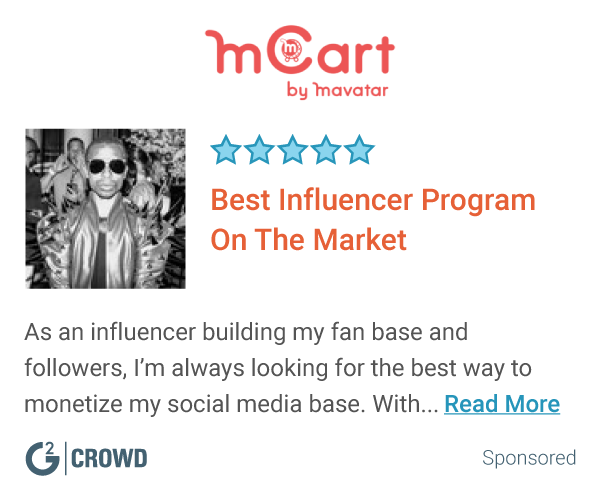 "Comprehensive, easy-to-use influencer management platform"
I love the ability to easily organize and track large amounts of influencers, and deep-dive into their social activity in one place. Their tool is extremely user-friendly and didn't require too much training to get acclimated. Having purchased other solutions in the past, I would also say that I've been impressed by the quality of support I've gotten from their team. They do a great job at onboarding and sharing the right amount of resources to help you get started. And they're very communicative when it comes to answering your questions and sharing product updates. Something on my wishlist is for Traackr to integrate with LinkedIn. Since I manage B2B influencers, LinkedIn is a key ingredient missing in the social activity. (Of course, this enhancement is more dependent on the LinkedIn API team, so it's not really Traackr's fault.) However, please be aware that you may need to do more manual work or set up other tools if you're interested in monitoring LinkedIn activity. Traackr is an incredible tool to help bring structure and science to your influencer efforts. However, don't forget that it's the personalization that set excellent influencer programs apart. Ultimately, the tool should help you strengthen influencer relationships and not dilute it into a transactional experience. Scaling influencer marketing - everything related to sourcing influencers, monitoring their activity, analyzing their profiles and fit, and tracking influencer metrics and insights. "Great influencer identification, awesome customer service "
Traackr's influencer identification features are definitely my most used. It's an incredibly helpful start in identifying influencers in new industries/verticals and helps to cut through the clutter. Their customer success team is the best in the business. They're super responsive, always quick to help and hop on calls and are open to feedback (and implementing it!). My team is often socializing our progress + results across a number of other team's within our company and the lack of a shareable and customizable reports has been challenging. If your main focus is in identification and management, Traackr is a great platform. They're also open to feedback, willing to implement changes and are constantly improving and iterating. Influencer identification and management, as well as reaching scale. This has been a helpful tool in cutting through the clutter, unearthing influencers that we may not have found by hand and keeping it all in one place to keep track of progress. Their morning emails with recent coverage has also been helpful in staying on top of trends and conversations. "Great Influencer identification platform for a B2B2C Company. " It's a great tool however it's very much time consuming. I wish we could export the influencers research and data in a visual PDF. Today this has to be made manually and it takes long time. "The perfrect tool to streamline your influencer marketing efforts"
Good tool that helps organize, evaluate, and identify influencers. Simple easy ways to organize influencers by projects and brands. This helps tremendously with reporting. Influencer profiles within Traackr makes it super easy to evaluate influencers. Displaying all of their social pages in one place is a timesaver! All the data provided helps put facts and analytics to decision making when it comes to influencers. Searching for influencers via the search bar in Traackr is as easy as searching on Google. Simple UX makes it easy to add additional team members to the tool. It’s a great tool but it’s the one tool for influencer marketing –still use additional resources (tools and agencies) to execute influencer campaigns. "Great solution to manage influencers"
Having to work with a lot of influencers to promote our products on Instagram, Traackr has been a great help for discovering and managing influencers, as well as analysing and quantifying their actions for the brand. Nothing much. We use the tool while being very aware of its features and possibilities, not asking for something it can't do. Being able to personalize more the auto-sent reports and highlights would be great though ! Being able to manage and analyze all the influencers we have been activating has been a great help to show KPIs and benefits from their actions. "Excellent tool for influencer identification and influencer relationship management"
I like how I am able to use the search functionality to narrow down a list of potential influencers in a specific subject-matter area. I still need to then look into each of their profiles carefully, but it makes the initial phase of exploration much easier than some of the other databases or pure web search. Where Traackr seems to be particularly strong is in the "relationship management" aspect by serving as a CRM that's tailored for influencer relations and influencer relationship management professionals. Overall if was very intuitive and easy to use without a detailed demo/onboarding process. I wish the influencer database was more comprehensive, but based on researching/writing a book that includes a section on the influencer marketing technology there are no perfect solutions out there. If you are considering an influencer relationship management software, I think Traackr is a strong solution that is easy to implement, and get up and running quickly. I was writing a book about influencer marketing and influencer relationship management. Traackr was helpful to identify different types of influencers to feature in the book, and manage the relationships I built over an extended period of time so I was able to get a feel for the end to end use case spectrum. "Traackr - Influencer Marketing and ROI made easy"
Traackr has been a very useful tool for our company. We've long struggled to put value on sponsored relationships with influencers, events and personalities and the when we could, it required a lot of manual labor. With Traackr, we're able to easily organize our projects and influencers for quick reference and transparency across global offices while being able to understand the quality and quantity of engagements that our influencers are having with their followers. The Traackr team is constantly working to add relevant features and takes our feedback to heart. Their customer support team is second to none, being readily accessible and willing to discuss any questions or concerns at a drop of a hat. There isn't much to dislike with Traackr, especially knowing the additional features that are coming in the future. Eventually, it'll be useful to be able to breakdown influencer posts by quality such as additional number of brands mentioned, how many hashtags are used in addition to your own, etc. Traackr has been a great tool in helping us increase organization and transparency across global offices. We're now able to quickly understand the relationships that are available to us through offices around the globe without having to use outdated spreadsheets or wait on an email to confirm. "Highly Useful Tool and Outstanding Customer Care"
Apart from the usefulness of the tool itself, Traackr customer care is the best of any vendor I've experienced. They are both responsive and quick to provide assistance when needed. I've used the tool for a number of years and that has been a constant from day one. The limitations on the number of projects our team could run simultaneously. This is something which the Traackr team has just improved upon for 2019! If you have need of researching online thought leaders - i.e. who they are, what they're saying, and where they're saying it - this tool is invaluable. In my opinion, those who fail to understand the importance of these people and the influence they have on all markets, do so at their own peril and risk irrelevancy. When faced with a situation where we need to understand quickly what thought leaders are saying about a particular topic, Traakr has proven its worth time and again. The ability to look from a high level, or drill down into a much more granular view has helped shape our messaging to be as relevant and timely as possible. "Solid influencer relationship manangement tool"
Traackr has been incredibly helpful in many stages of our influencer program, from identification and research, to tracking engagement and reporting. The customer service has been phenomenal. I always get answers to my questions right away, and receive regular check-ins from the team to offer support or share new feature developments. With an ever-evolving tool like Traackr, occasionally I find myself having to hunt for a particular feature or search function, and there are a few functionalities that would be helpful that the tool does not yet support. However, between the excellent customer service and their ambitious product roadmap, I feel confident that this is the right tool. Influencer identification and management. Traackr provides a great place to start when trying to figure out who matters in my business or industry. Being able to manage a large roster of influencers, and see who we're making progress with, etc. is really easy through Traackr. Also, the reporting offers up some interesting insights, as does the network map, which shows who is influencing your influencers. "Excellent influencer management tool enabling to shape your influencer marketing approach"
Has helped the teams to get more professional in the influencers approach being able to target and screen the audience. "Great for identifying influencers and growing influencer lists"
I love the interface, very easy to use and, more importantly, easy to train new users to use. I also love how it ranks influencers by reach, resonance and relevance to clearly indicate who is most impactful. If you upload several influencers with lots of followers, it may take a day or two to process on the platform. Traackr is great for quickly learning who is driving coverage and conversations on any given topic or brand. It also lets you explore the wider network of influence (who is influencing your influencers), which makes it a great discovery tool. "Traackr should be a key part of influencer plan"
First, the team. Great attitudes and a willingness to help. The platform itself is a world class tool that continues to evolve to meet the needs of the landscape of influencer marketing. My only complaint is that I can't spend as much time on the platform as I'd like, since it has so many bells and whistles. Spending time in the beginning to learn as much as possible is really crucial. Quickly understanding the reach, relevance an resonance of an influencer. Validating current influencers. Discovering new ones. "The best influencer research, targeting and reporting technology I've used yet"
The influencer search seems to have the most rigor included and the broadest reach and ranking system. I particularly like the ranking system based on relevance. I've been with Traackr for several years now and continue to see it's solution get better and better. I suppose evolution of a thriving product's interface comes with the territory. Traackr seems to be constantly evolving the UI which is great but means I need to pay attention more. The new features and functionality are aways an improvement so learning new tricks is worth it at the end of the day. Influencer marketing is not a one and done pursuit. To get the full value out of influencer marketing be prepared for the long haul and having a tool like Traackr at your side to provide feedback and help direct efforts. Being able to focus in on the most productive and important people for any particular topic and subject matter expertise saves a ton of time and focusing on the wrong shiny objects. I'd say most organizations could focus almost solely on influencer marketing with Traackr and do fine in the marketplace, without a broad social media listening tool. "Great Customer Service, Easy to Use Interface"
One of the main reasons I use traackr is to pull reports on campaigns we've run. Uploading influencers, finding new and similar influencers, then tracking and pulling all posts are very simple to manage. The reports can be customized as often as needed and there's a quick turn-around for last minute meetings and presentations. The platform is constantly being updates for user optimization, however it can make finding things difficult. Customer Service is quick to respond to questions, so this is not something that really hinders work. Optimizing who we choose to send product to based on audience engagement. It's super simple to see the ROI from our influencer strategies and optimize our lists. "Traackr helped build our digital influencer strategy from the ground up!" - To build out a digital influencer marketing strategy, Traackr gives you all the tools needed. The framework they've built around identification, engagement, and communication with influencers was easy to adopt and work into our model. - Platform is extremely user friendly and has explanations and definitions throughout. - Visualizations of data about influencers, and connections between influencers, are extremely useful and consumable. The process behind setting up analytics in the platform isn't the most obvious, but again, the Traackr team is more than willing to step in and help get you the data you need out of the platform. Our influencer marketing efforts in the past have been primarily event-based. When we found Traackr, we were looking to extend our influencer engagement efforts into the digital space and form long-term relationships with our audience. Traackr has provided us with an easy-to-use platform to accomplish this, and we're driving more social mentions from influencers per quarter than ever before. We've also been able to take some of these relationships to the next level and partner with influencers to create original content that resonates with our audience. Managing multiple influencer programs can is made easy through Traackr. Centralising the whole program has been so helpful for what we do each day. Also Being able to discover and work with influencers that were otherwise unknown to us and our clients is what continues to make Traackr the platform of choice. There are always tweaks and improvements to be made in anything and Traackr makes the conscious effort to acknowledge these suggestions which is great. The one thing that we are challenged by is not being able to acknowledge content created and shared on blogs or media sites in reporting. Also not being able to pick up stories analytics. Traackr has allowed us to align more specifically with influencers. Understanding their audience and alignment to brands has meant more targeted engagements for various campaigns. Also analytics reporting is super simple. "Smart tool but not super useful "
It's a smart idea for a tool by keeping track of influencers. Great for organization. The database of influencers isn't super impressive and i'm not sure it's something that I couldn't handle on my own with a spreadsheet. Explore your own capabilities before jumping into a tool like this. There are tons of ways to find influencers and not sure this is the total necessary route to go if you're in need of an influencer campaign. Setting up a spreadsheet can be just as effective in managing influencers and to locate them, I've found that internet research is the best way, not a tool like this one. Organization is the true business objective being accomplished by it. I've realized that keeping track of a ton of influencers for a campaign isn't easy but a tool like this helps manage that in great ways. "Great tool even for small markets"
It organizes a lot of the work. You can quickly check up on your influencers and see what they're up to, see their posts and metrics. It is really helpful. My case is very particular since I live and work in a very small country, so we had to form our database kinda manually. We had to add influencers and profiles by link. Time. Time is our most valuable resources and with traackr a lot of the work gets easier, so I get to save time and that absolutely the most important thing to me. "Fantastic Influencer Marketing Management Software"
Easy of use, outstanding customer Support, global solution and team and multi lingual functionality. I would recommend the solution to any Enterprise looking to standarize influencer marketing. Full capabilities from influencer identification, validation to reporting and audience analysis. Nothing specific that I deslike. It would be great to have WeChat interface. I would strongly recommend the product. We have achieved significant efficiencies mainly in the time it takes us to analyse, validate and report on influencer activity. The tool has also provided a consistent influencer framework and process to be shared accross different teams. One of the things that stood out to me with Traackr is their commitment to customer services. I've used a lot of tools in the marketing field and they, by far, provided the best customer service. Our rep would be ready to help talk us through a project or find solutions for a challenging, niche area to explore. I really disliked that the platform does not support boolean search queries. I understand that it was made that way to make it more user-friendly, but without the support of boolean, I felt like it took more time to build and refine queries. I used Traackr because my agency needed a tool to identify influencers is really niche and sometimes complicated topic areas. I felt like Traackrs ability to do so was really strong. This tool makes pitching and securing influencers super easy. The demographics tools are also amazing for when vetting influencers. We use this to make most of our decisions. Would love if there was a social listening component to this too. Traackr assists in basically all parts of our social strategy. Great way to get quick data on influencers and their audience demographics. Wish the platform pulled in all mentions across social, not just mentions from those within your network. We initially invested in Traackr to help us easily organize our network of influencers. One of the large benefits is that the platform provides us with analytics that help us decide which influencers are the best fit for specific campaigns, making us feel more secure in our decisions on who to work with. "Traackr for Influencer marketing review "
The ease of use and being able to find influencers i different regions including EMEA and some APJ. Also, being able to track results of activities is key to demonstarting the impact of influencers. The customer service is amazing and the follow-up is fast anytime we need help. The team is able to offer advise on how to find influencers and share best practices of influencer marketing. Wish they had the demographics feature - but that is a nice to have. The identification of the right people for our program is key to success as well as tracking results and the impact on marketing. "Needed influencers for a quick turnaround and this did the trick!" I was in a quick pinch for identifying a handful of influencers and with a minimal investment in Traackr, we were able to get and vet the list quickly and meet our deadline! It was really easy to use and use-friendly. It is a very basic, no-frills tool, but it's still gets the job done! It also didn't pull all of the information I was looking for for the individuals, some were missing email addresses when I needed those specifically. We were looking to identify a group of individuals talking about a certain range of topics. We were easily able to create the query and parameters and Traackr quickly was able to spit out a list of people for us that it thought fit the parameters. "Review of localized influencer searchers"
The report export should be more interactive. Create a standardize influencer export function that has hyperlinks to accounts of influencers and picture displays along with rankings. "Great tool + Great Customer Support"
Although the platform is easy to use, I feel like it is easy to use once learned and that discovery is a bit difficult. We have been able to analyze different groups of consumer and pro influencers that we are working with and make decisions about future strategies. "Very useful influencer marketing software"
Traackr was my introduction to the influencer world. Using Traackr I have been able to learn about the influencers trends, who matters, how influencers boost todays market. There is no campaign results option. I need to use another software to be able to get the desired results/outcomes when doing my post event analysis. I was not able to export reports to excel. We use Traackr to conduct an influencer analysis to drill down on and assess what’s working and what’s not from an influencer seeding perspective and also to find efficiency within to our list. I like having a CRM system to track influencers and seeing all of their public accounts at a glance with reach next to each channel. I don't love the discoverability of influencers and I don't think their database is updated frequently enough to reflect the most up-to-date information. It had some decent social listening tools. Overall it was not the most user-friendly platform. Traacker was used to help us with social listening and helped us identify trends and key influencers. "Best software to manage influencer relantionships"
I've been looking for a long time to have some sort of CRM software specialized for influencer marketing. Traackr does that perfectly by letting me identify influencers and then keep track of our interactions with them. The design is nice and simple and the product works well but the outstanding part is in the data it provides. I've had temporary glitches with the email capture system in the past. Start with a small list of maybe 20-30 influencers. Grow the list in phase 2. I liked that Traacker provides Reach and Relevance scores for its influencers. This helped us come up with the influencer identification process we currently use. However, Traacker often did not "find" the influencers I was trying to look up, and after several attempts to use the platform (which was often very buggy), I quit altogether. We were trying to identify influencers to engage with on an ongoing basis for a large financial client. Traacker helped us develop a process for identifying influencers based on reach and relevance, but I ultimately went to other tools to identify the right influencers. Followerwonk I've found is a better option than Traacker (and it's free). It's a really strong influencer tool with incredible customer service. "Influencer marketing space is still emerging"
Traackr is an innovative step forward in the influencer marketing arena. Not much to dislike but for any tool such as this, scale is what matters most. It will take time and hopefully Traackr will continue to make progress. Still experimenting across a few teams. No committeemen yet. There are several other emerging tools in this category. * We monitor all Traackr reviews to prevent fraudulent reviews and keep review quality high. We do not post reviews by company employees or direct competitors. Validated reviews require the user to submit a screenshot of the product containing their user ID, in order to verify a user is an actual user of the product. Hi there! Are you looking to implement a solution like Traackr?